Does your dog or cat like to cuddle in your bed or curl up on your couch? Is snuggling with your furry friend a part of your routine? Dating back some 600 years to fourteenth century Germany where they were initially developed in the court of Charles IV, Bohemian textiles have long added an inviting look and feel to living spaces. Originally, Bohemian textiles stood apart from other art forms of the day because they lacked any elongated patterns that seemed ever-present in other art forms. Artists were more apt to present the female form in the patterns of the original Bohemian textiles. The Court of Charles IV is known to have produced at least one altar piece. This piece somehow made its way from Rome to Prague where it is still on display to the general public today. Most initial Bohemian textile art was developed in Italy and eventually travelled north, well past the Alps where it held an influence over French artists of the day. Attached to the Papal Court of Avignon, there was an Italian artists’ village which was instrumental in the early development and production of Bohemian pieces. Many of the early works produced in the village found themselves displayed in the Papal residence throughout the 1330s and 40s. One of the early owners and supporters of these early Bohemian works was Simone Martini, who was a well-known Sienese precursor to the Bohemian style of textiles, including carpets, tapestries, and bedspreads. The Bohemian style of textiles such as tapestries, rugs, and bedspreads gained huge popularity in 1960s America, being dubbed “the hippie style” by the younger people of that era. In our more modern culture, the Bohemian style is largely related to people who lead an unconventional, artistic lifestyle. People such as Virginia Woolf, the Bloomsbury Group, and the Stephen Sisters are largely related to the Bohemian, hippie style. You might try layering rugs by placing one directly on top of another or simply overlapping slightly. Pick a larger rug and cover part of it with a smaller, less expensive rug. Overlapping pillows is another inexpensive but effective way to create a Bohemian style space. After all, what could be more comfortable than a huge pile of pillows to sink into with a good book. Drape Bohemian printed fabrics over tables and chairs. Your furniture and its prints becomes less important when you drape it with tapestries or bedspreads. Simply cover anything that doesn’t quite match the way you want it to. Vertical Displays are a great way to add color and feel to any wall. Hang a tapestry, or use a kantha quilt as draperies. Let your imagination go wild! The art of Batik, referred to by many as a craft, has been around for centuries, and has become increasingly popular in recent years. It has come to be known in the west as a wonderfully creative medium. The art of dying cloth utilizing wax and dye finds its humble beginnings centuries ago in Java, Indonesia. Batik itself is part of an ancient Indonesian tradition and some of the finest batik cloth in existence still comes from the Java region of Indonesia. 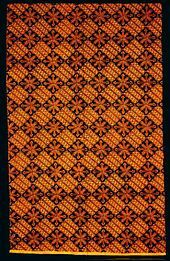 The word batik is derived from the Javanese word tik which literally means to dot. Full Moon Loom offers a wide variety of Batik cloth for you to choose from. Visit Full Moon Loom today to learn more about or to order your Batik cloths. Dying cloth in the batik style is relatively easy, but requires a great deal of patience as it can become somewhat tedious and involved. The process begins by “blocking out” areas of the cloth by brushing or drawing hot wax over them. The cloth is then dyed a specific color. The parts covered in the wax resist the dye and remain the original color. The process is then repeated, often several times, blocking out different areas and using a different color dye each time. After the final dying, the wax is removed from the fabric, and the result is oftentimes, simply breathtaking! Batik has become one of the textile industry’s most expressive and subtle forms of the resist methods. And Full Moon Loom has a full line of Batik printed products available. The ever-expanding variety of techniques that are currently available affords the artists opportunities to explore this unique process in new, flexible, exciting ways. Modern day Batik artists continue to expand the art form without losing its simple roots. Visit Full Moon Loom today to learn more about, or to order your Batik Cloths. Our wide selection of styles, patterns and colors is sure to offer something that will fit your individual needs and style. Next to agriculture, the textile industry is the largest employment sector in all of India. The textile industry directly employs over 35 million of India’s populace. With some 2500 textile weaving factories nationwide, textile is without question one of India’s largest exports. And Full Moon Loom imports a great deal of Indian textiles for use in their varied products. Plus, right now, for a limited time only, Full Moon Loom is offering free shipping an all Internet purchases. Man-made fibers. These include the manufacturing of clothes and filament synthetic yarns. This sector alone employs approximately 4.8 Million people. The cotton sector. Cotton represents the second most developed sector in the Indian textile industry but the number of people employed is somewhat erratic due to cotton being a seasonal fabric. The handloom sector. This sector is well developed with a market share of about 13%. The woolen sector. India is the seventh largest producer of wool on the planet, producing about 1.8% of the world’s total wool. The jute sector. India is the world’s largest producer of jute, or golden fabric as it is endeared to the Indian populace. Most of India’s jute is produced in the eastern portion of the country, in places like Assam and West Bengal. The sericulture and silk sector. Producing 18% of the world’s total silk makes India the largest producer of silk in the world. This is also the most labor intensive sector of India’s textile industry. Visit Full Moon Loom today to learn more about, or to order your Indian cloth, fabric, and textiles in general. Our wide selection of styles, patterns and colors is sure to offer something that will fit your individual needs and style. Indian textiles offer a rich and colorful array of decorating options to elevate the mood and appeal of any room. Among their many other uses, these fabrics make for exceptional wall hangings, whether as a mere accent piece or as the central motif. Here are a few ideas for using these amazing fabrics as an inspiring and transformative wall decoration. Choose a colorful Batik, Rajasthan, or Bagru to attach to the ceiling and wall over and behind your bed to make a striking headboard and or bed canopy. Installation can be accomplished easily with a few ceiling hooks and dowel rods. Here is another example, courtesy of Pinterest. Choose a rich Paisley or Jaipur as a complete wall covering. The experts at HGTV have a handy tutorial for this installation. This is an old “Army wife trick”, useful because it is a great decorating option for those who are renting and/or do not expect to stay in the home for long. It is also a great trick for decorating your walls seasonally! Using fabric as opposed to wallpaper offers ease of installation and can be peeled off with no mess on your hands when you’re ready to leave or simply to change up your motif. Following in the spirit of starched fabric wall treatments, a favorite fabric or assortment of fabrics can be stretched over blank canvases and arranged on the wall as art pieces. Creation of these pieces can be accomplished in a variety of ways. One way is to adapt the process from the wall covering idea presented above. Once again, with thanks to Pinterest, we can see some amazing examples of this idea here and here. Probably the most obvious decorating idea is to use a fabric piece as a simple wall hanging, as with a tapestry. Traditionally, a tapestry is a thicker woven piece intended to be displayed in this way. However, just about any ornamental fabric can be adapted to this use, whether it’s a lightweight rug, a blanket, throw, or spread, or just a piece of un-purposed fabric that is fabulously colorful and or ornamental. Some examples can be seen here, here, and here. Full Moon Loom offers hundreds of beautiful fabrics and textiles that can be used to decorate the walls of your home. Browse our menu to the left to shop the largest selection of Indian decorating textiles in the U.S! For more information about Full Moon Loom, visit our “About Us” page or call (603) 708-1271 to speak to one of our knowledgeable sales and support staff. The modern day tablecloth is loosely defined as a cloth to cover the table. Oftentimes for aesthetic purposes, a tablecloth also performs as a protective barrier to save the table top from stains and scratches. Tablecloths are usually laid out prior to other table linens, tableware, and foods. Tablecloths are currently made from many different materials including cotton, poly-blends, and even a PVC material that can easily be wiped clean. At Full Moon Loom, all our table linens are made from the finest cotton loomed and printed in our own facility. Each of our table linens including tablecloths, table runners, napkins, and placemats are design coordinated to lend your table setting to an elegant, pleasurable dining experience. Simple table cloths of all white or mostly white were the first table linens. And they date back only to around the seventeenth century. During the medieval period the spreading of a high quality linen cloth was an imperative aspect of meal preparation in wealthy households. As time went on the table set up evolved to begin including the arrangement of tableware on cloths for most social classes excepting the extremely poor. As conventional eating habits began to change in the twentieth century, a much wider variety of table settings began to develop. Today, many formal dinners still utilize the plain white tablecloth, oftentimes made in the fashion of a damask weave, even though other colors and patterns are now quite normal. You will find that a Full Moon Loom table linen set is ideal for every occasion, from casual to fine dining, our table linen settings add an elegant look and feel to any meal. Full Moon Loom’s table linens can help you set the appropriate mood for your next dinner party, and our wide selection of colors, patterns and styles are sure to please even the most discerning of tastes. Add matching window treatments, and coordinate a tapestry wall hanging to create a truly elegant dining room decorum. Full Moon Loom offers a unexpected collection of fine tablecloths, placemats, napkins, and table runners available in variety of colors, textures, patterns, and styles. All are comprised of 100% cotton, are machine washable and tumble dried. In years past, you could hardly find a home that did not feature a large table covered in gorgeous linens. Today, the dining room table remains as the center piece to virtually every home. It is the place where friends and family gather to discuss the many aspects of their individual lives or enjoy a fine meal together. A Full Moon Loom table linens setting will help you create a warm, inviting gathering place certain to wow your friend and family alike. Visit Full Moon Loom today to learn more about, or to order your table linen ensemble. Our wide selection of styles, patterns and colors is sure to offer something that will fit your individual needs and style. Tapestry is a form of textile art. All the spreads and tapestries produced by Full Moon Loom are made from 100% light to mid weight cotton. We make our tapestries slightly thicker than a normal bed sheet and offer two distinctive styles of weave. Power Loom – Power Loom tapestries and bedspreads are produced from a machine loomed cotton. This process produces a tight, smooth weave. This type of weave is highly recommended as we feel it offers a far more durable fabric. Hand Loom – This process uses cotton material produced on a hand loom. This process dates back to a time before the introduction of machine looms. It provides the texture of a light summer tweed. This method is very popular which is the reason it is still in use today. All Full Moon Loom tapestries and spreads are produced from one piece of fabric, that means no seams. Two of the edges are salvage which is the finished edge of fabric and two edges have tiny hems. You may notice slight irregularities in the prints. These are associated with hand made products and should not be considered as defects in the product. You must try to remember, each tapestry and bedspread is produced by hand, making each unique unto itself. It is important to remember your own appreciation for art when selecting and purchasing a tapestry or bedspread from Full Moon Loom. All our tapestries and bedspreads are unique works of art and can be utilized and displayed in a variety of ways; as a wall hanging, bedspread, beach blanket, furniture throw, tablecloth, or canopy. The possibilities are virtually endless. We also offer window treatments to accent some of our designs to create a complete ensemble. Many people purchase two, using one to create their own window treatment or furniture throw to accent the bedspread or tapestry. Below is a list of various specialized styles we carry. Each comes from a distinct area of India and expresses that area’s culture and heritage. Many of these patterns have been passed down from one generation to the next spanning several centuries. For a complete description of each, please click here. Visit Full Moon Loom today to learn more or to order your own one of a kind, handmade tapestry or bedspread. Batik is the art of wax-resistant dye on fabrics to create beautiful and colourful designs. This traditional method of dyeing is followed in countries like Indonesia, Sri Lanka, India, Nigeria, Malaysia, Singapore, and the Philippines. Indonesian batik, practised in the island of Java, is the best known in the world and boasts of supreme workmanship, quality, techniques, and patterns. The word batik is derived from the Javanese word 'amba' which means write and 'tik' which means a dot. Batik art can be done with various kinds of dyes and different fabrics like cotton, silk, wool and other natural fabrics. After the final dyeing, the wax is removed. The process at times takes almost a year for the cloth to be ready for use. Indonesian batik had become a dying art but has again revived in the 21st century. From being a traditional piece of adornment to a fashion statement, it is not only popular in Indonesia but is gaining acceptance worldwide. Batik was introduced to the USA, Europe, and other countries in the west by the Dutch, as Indonesia was a Dutch colony. The United States of America is the most important client of Indonesian Batik. About 37% of traditional batik textiles are exported to the U.S. Batik exports to the U.S have grown from USD $ 22million in 2010 to a figure of USD $340 million in 2014. South Korea, Japan, Germany, Britain, and Netherlands are also good consumers of batik textiles. Countries like India, Malaysia, Singapore, China, and Sri Lanka are also producers and exporters of batik fabrics throughout the world. From being an attire to be worn as traditional ceremonies like birth, wedding and death, Batik prints have come a long way and become icons of chic clothing and fashion statements around the world. Due to its simplistic designs and delicate art forms, batik is loved by all. It can be placed over a piece of canvas to create a masterpiece painting or stitched as curtains, sofa covers or quilts to lighten up the offices or homes. In October 2009, the UNESCO has acknowledged batik art as a Masterpiece of Oral and Intangible Heritage of Humanity.